Is the Butano Dairy the Cloverdale Dairy? Mike Merritt(MM): I do have a question about you latest posting of the Coburn Mystery. In chapter 44 you mention the how Coburn ran “the Butano Dairy with 100 milk cows and 50 head of cattle. There was a house, barn, butter and cheese factory to look after.” Do you know much more about this dairy and it’s location? 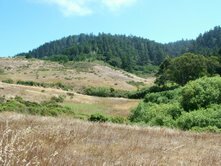 June: As I continue posting the story from the original manuscript, I may find more information on the Butano (Cloverdale?) Dairy. What you say makes sense–maybe it was called both names, Butano because that was the name of the grant; Cloverdale, because the original owners gave it that name. Does anyone have more information about the Cloverdale Dairy? MM: I know that Edgar Steele ran a dairy when the Steele’s first leased Coburn’s land in the early days. 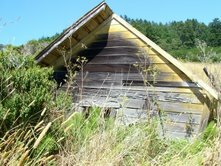 It was located along what is now Cloverdale Road halfway between the Little Butano and Gazos canyons. He didn’t work it for very long and not much is left today. It was known, I think, as the Cloverdale Dairy as well. All that remains is a small building half fallen down with no windows with faded yellow paint. There is also a large eucalyptus that was surely planted for shade and many disturbed sites that would have been buildings. The local rancher bulldozed a barn in the 70’s. It could be that your Butano Dairy is different than this Cloverdale Dairy but not sure. I will send a couple photos along. Here’s the photos from Mike. This entry was posted in "Mountain" Mike Merritt, The Butano and tagged The Butano. Bookmark the permalink.